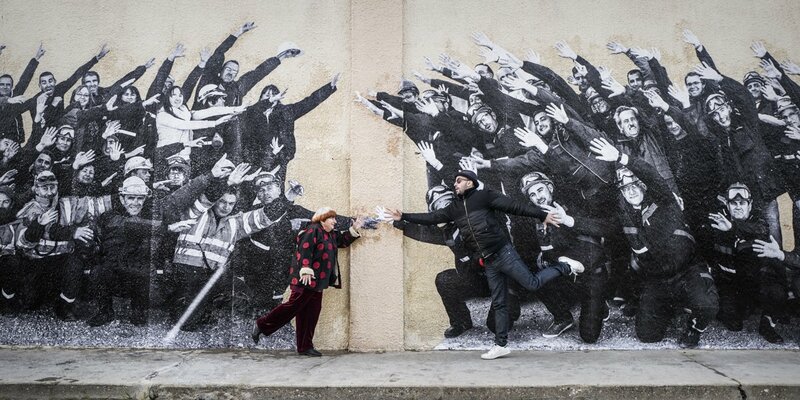 French master Agnès Varda collaborates with mysterious street artist JR in this wondrous travelogue, in which the duo travel through small villages in the French countryside and immortalize the faces of those they meet. After being away from films for almost a decade Agnès Varda’s newest documentary seems like a wondrous collaboration with JR. The film will have its premiere at the 2017 Toronto International Film Festival. 88-year old Agnes Varda, one of the leading figures of the French New Wave, and acclaimed 33-year-old French photographer and muralist JR teamed up to co-direct this enchanting documentary/road movie. Kindred spirits, Varda and JR share a lifelong passion for images and how they are created, displayed and shared. Together they travel around the villages of France in JR’s photo truck meeting locals, learning their stories and producing epic-size portraits of them. The photos are prominently displayed on houses, barns, storefronts and trains revealing the humanity in their subjects, and themselves. 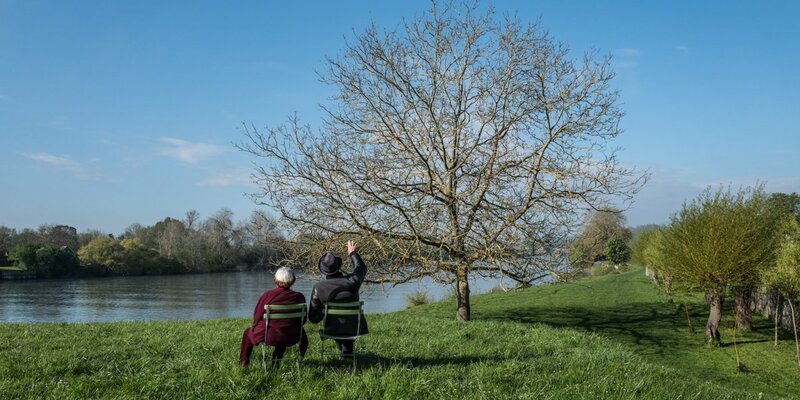 Faces Places documents these heart-warming encounters as well as the unlikely, tender friendship they formed along the way. Agnès Varda was born in Ixelles, Belgium in 1928 and grew up alongside four brothers and sisters. In 1940, her family moved to the south of France to escape the war. She spent her teenage years in Sète then moved to Paris where she studied at the École du Louvre and took evening classes in photography at the École de Vaugirard. Varda became a photographer for Jean Vilar when he founded the Avignon theater festival in 1948, then for the Théâtre National Populaire at the Palais de Chaillot in Paris. She held her first personal exhibition in 1954 in the courtyard of her home. That same year, Varda made the move to cinema without any formal training. She founded Ciné-Tamaris (a cooperative) to produce and direct her first feature, La Pointe Courte, which has earned her the title “Grandmother of the French New Wave.” She has since directed short films and features, both fiction and documentaries. In 2003, she began her third career as a visual artist at the Venice Biennale. Varda lives on Rue Daguerre in the 14th arrondissement of Paris. She married filmmaker Jacques Demy (deceased in 1990) and together they raised Rosalie Varda-Demy, costume designer turned artistic director, and Mathieu Demy, actor and filmmaker. JR was born in 1983 near Paris and currently splits his time between both France (Paris) and the US (New York). In 2001, he found a camera in the Paris Metro and began documenting his adventures in the subway and on rooftops, then pasting the pictures on outdoor city walls. This marked the beginning of his work with monumental black and white photos. 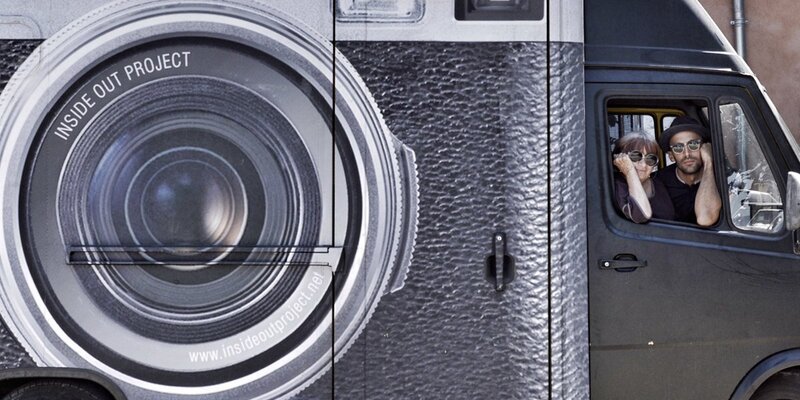 JR exhibits freely on the walls of the world, attracting the attention of people who don’t typically visit museums. He pastes photos in the public space to reveal the faces and stories of people who aren’t visible, from the French slums to Turkey, from Times Square to the Pantheon in Paris, from the ghettos of Kenya to the favelas of Brazil. When pasting, community members take part in the artistic process, and there is no stage to separate the actors from the spectators. Since he remains anonymous and doesn’t explain his huge portraits, JR leaves room for an encounter between the subject/protagonist and the passerby/interpreter. This is the essence of JR’s work: asking questions. “FACES PLACES” WILL PREMIERE AT THE TORONTO INTERNATIONAL FILM FESTIVAL ON MONDAY – 11TH SEPTEMBER UNDER THE ‘MASTERS’ SECTION.